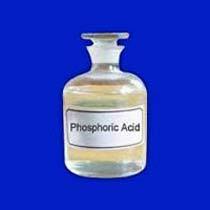 As a renowned Manufacturer, Supplier and Exporter of Phosphoric Acid, we bring you a wide range of immaculate quality. Our skilled professionals use only high-grade raw materials to ensure that our product meets the highest quality standards. Its features such as non-toxic, effectiveness and optimum composition make it an interesting proposition. To further add to its allure, it is available in customized specifications at cost-effective prices.